Here’s a draft syllabus for March’s online course. This is the first draft and will not be the official one. Participants will get the official one shortly before the course begins. In the meantime, have a look and let me know what you’re wondering about. It’s going to be a good old time. The goals of this course are to broaden participants’ knowledge of (a) curricular approaches to function relevant to the middle school, and (b) the ideas behind the formal mathematical idea of function. An important assumption behind the content of this course is that item (b) above encompasses both formal/logical components and psychological components pertaining to how both sophisticated and naïve learners think about these ideas. This course takes place entirely online with no requirements for synchronous participation. Regular, daily participation will be essential but time of day for this participation is at participants’ discretion and convenience. See Principles of the course below. This course will run using the learning management system Canvas from Instructure. All materials will be provided as downloads or links through Canvas. But full participation is not just about seat time. It is about committing to learning, and to supporting the learning of your classmates. We are here to learn; this will require critical examination of what we think we already know. We cannot be possessive of old ideas—we need to be ready to expand them, to let go of them when necessary, and to welcome new ones. We should seek to appear curious, not smart. We all bring expertise; we should seek to share ours, and to take advantage of that of others. This is not a pedagogy course. We will examine mathematics and curriculum quite closely, but implications for teaching are not the direct product of our activity. Conceptual insight is. Instructional implications will follow. These may require long term fermentation before ripening. We should base our arguments and claims on evidence. We should ask honest questions, and lots of them. Discussions are not ever closed. Continue to contribute to old discussions as we move forward; it would be lovely to have each discussion be a record of our developing thinking. Approximately one hour per day for the duration of the course is expected. The “hour” is an average and is at a participant’s convenience. This course is ungraded and not for college or graduate credit. All participants adhering to the principles of the coruse above and completing all assignments will be issued a certificate for clock hours towards relicensure. Participants requiring additional documentation of their participation should email the instructor with necessary details. Introductory activities: Reading principles of the course, introducing ourselves and exploring the online platform. Discussion: What is a function? Participants will discuss their own understanding of functions, the ways that they and their students think about functions, and the relevance of these ideas to middle school curriculum. Tasks: Participants will work a number of paper-and-pencil mathematics tasks involving function ideas. These tasks either come directly from elementary and middle school curricula, or are adapted from them. Sources include Everyday Mathematics, Connected Mathematics and Mathalicious. Reading: Vinner, S. (1992). The function concept as a prototype for problems in mathematics learning. In E. Dubinsky & G. Harel (Eds.) The concept of function: Aspects of epistemology and pedagogy. Mathematical Association of America. Discussion: Participants will work to integrate the ideas from the initial discussion with those in the tasks and the reading by considering the question, What images do you carry around pertaining to function? together with the implications of these images. Task: Participants consider functions graphed in polar coordinates. They begin with a game from Connected Mathematics to develop polar coordinates, and move to simple (i.e. constant and linear) functions. The exact form of the product is not important. The important thing is that it adhere to the spirit of the assignment, which encompasses these two criteria: (1) it should be made public (i.e. shared beyond the course participants), and (2) it should incorporate one or more ideas of the course pertaining to function. To complete the course, the product—or a link to, or a photograph or other description of the product—must be submitted through Canvas. We were promised jetpacks and we got algorithmically-generated online skill practice instead. READ IT, WATCH IT, PRACTICE IT, MASTER IT, and CHAT ABOUT IT. Unique pedagogical features, huh? Read, watch, practice instead of watch, practice? Ugh. Can you calculate your grades by hand? Decreased grading workload for the teacher. Increased access to updates on their grades. There are outliers in both groups, of course. I make a gross generalization in order to make a point-there has been great attention to and investment in educational technology in recent years, but teachers and students are not in agreement on what purposes that technology should serve. I have written recently about Sophia, an online social learning platform, that relates to the first expectation of teachers and students above. But on my mind right now is students’ access to updates on their grades. So I do not post grades on D2L. My students are critical of this and I have wondered why. I contend that their discontent goes deeper than their expectation of being hyperconnected and instantaneously updated. I contend that teachers have used electronic gradebooks to make their grading schemes too complex for students to understand. I contend that students don’t expect to be able to figure out their own grades, so they look to D2L to figure those grades for them rather than looking at their scores on work that has been returned to them. My first semester at my current institution, I had a student whom I will call Aaron in my Math Center course. The Math Center is where we teach our developmental math courses. It is a carefully constructed machine in which each individual teacher has a narrowly defined role to play, and where there is little autonomy. In particular, the grading scheme is standardized across all sections: 60% tests, 20% final exam and 20% participation points. Well, you are averaging 77% on the first two tests. There are five tests for 60% of the grade, so you have 77% of the 24% of the grade determined by these two tests. Let’s assume you get all of the participation points, so you have 100% of that 20% of the grade. So we need to figure out what percent you need of the remaining 36% of the grade that comes from the tests, and what percent you need of the 20% that is the final in order to get 90% or better in the course. But in order to solve this inequality, Aaron would already have to have passed the course in which he was enrolled. In the courses I teach outside the math center, I take a different approach. The semester has 100 points. The weighting is built into the point values of each graded item. So if I want exams to be worth 60% of the grade, then I have 60 points to distribute across however many exams I am giving. At any moment in the semester, a student can simply add the points they have gotten, the total points, divide one by the other and consider the quotient as a percent. I can figure these grades quite easily without my computer and I can answer a question like Aaron’s quickly and easily. Can you say the same for your grading scheme? If not, can you defend the complexity of your scheme? Does it serve to motivate, inspire or inform? Or does it serve to obfuscate and to place a barrier between performance and evaluation? 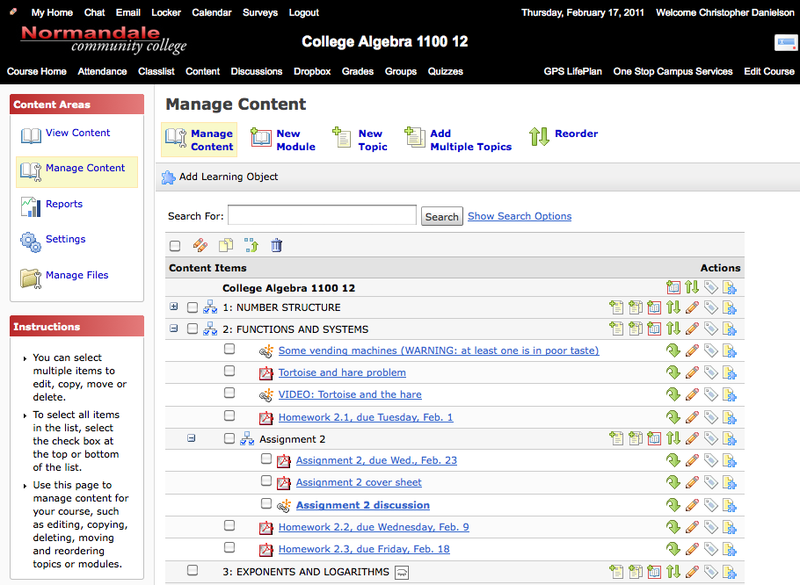 Computerized gradebooks allow us to create complex grading schemes. But that doesn’t mean we should. A new online tool for teaching and learning-Sophia–is now available publicly. You can read my Sophia comments from a couple of weeks ago here on WordPress. And you can get a sense of the tool by taking a quick glance at a few of my packets on Sophia, including ones on circles, division algorithms, squares and Rolle’s Theorem. I have lately been experimenting with a new “online social learning platform” called Sophia. It is still in private beta testing, but has an impending public launch date of March 7, 2011. You can go to their site now and watch their introductory video, which is of course about their grand plans. I have a more selfish interest in the project. It’s a really simple platform for providing online supplemental content to students in my courses. I am a teacher who writes. For years, I have written little follow-ups on activities and lectures for my students. I have written emails to students in response to questions. I write curriculum. Part of my reason for starting this blog was to have a place to write to my students and have that content be available to the larger world. But I have not written very much using the Instructional Management System (IMS) adopted by my state college system (ours is Desire2Learn, or D2L). That’s because supporting instructor-developed course content is something this system does very poorly. Of course D2L is not alone in doing a crummy job of this, but it’s the one I have to struggle with. Think of an IMS as a classroom. With D2L, it is as if the classroom had been designed with only a very small screen and an overhead projector-no chalkboard, no whiteboard, no multimedia projector. And the transparencies are kept in individual envelopes, requiring an elaborate ritual to access a new one each time. And any pre-made transparencies have to be reformatted before they can be used. But then the Sophia staff presented their new tool at my college last fall. I saw the tool very selfishly. It would fill a need that I had for my students in my courses. Sophia was offering to use their gorgeous new whiteboards. Or chalkboards if I preferred. And I could have as many transparencies at a time as I wanted. And I could have that LCD projector to show some video if I wanted to do that. And it would all be free for me, and free for my students, and I could keep my copyrights. And I could invite the world to my classroom if I wanted. 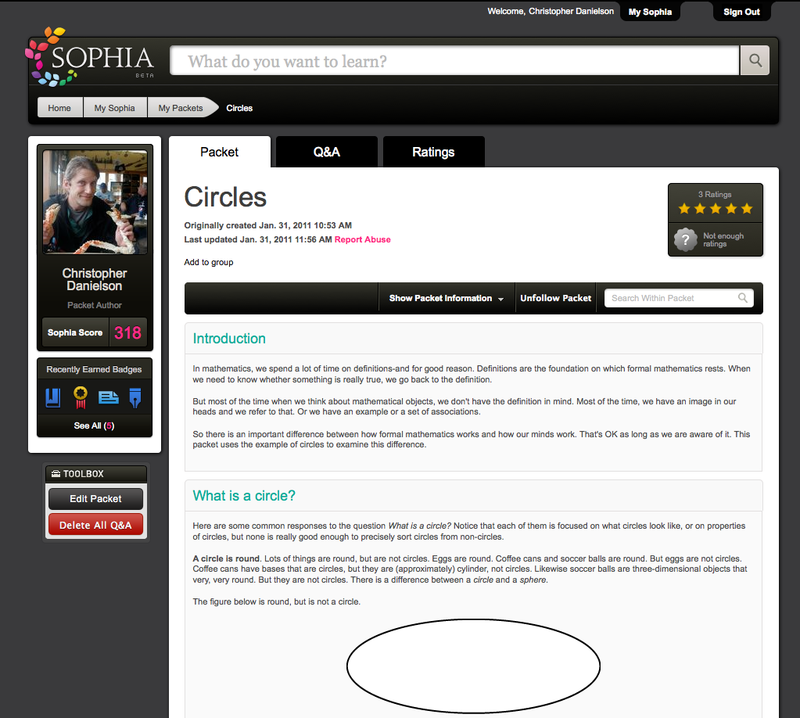 As an online learning system, Sophia makes it easy to develop a primer, tutorial, summary, etc. of a single topic at a time using multimedia. Text, audio, video and graphics can be quickly combined in a single page called a “packet”. Packets have simple, straightforward and permanent web addresses and can be easily linked. In contrast to D2L, these links are real links and take the user out to the linked page, whether it’s another Sophia packet or any other webpage (D2L processes all links through its server-and the process is less than 100% reliable). And the graphic design is lovely. D2L is ugly and makes me feel like I am working in a Soviet-era Russian office building (see image below). Sophia is like a breath of fresh air. I feel unconstrained and comfortable-more like working in an open, clean, lofty coffee shop. Where D2L and most other Instructional Management Systems are concerned with privacy and proprietary code, Sophia is concerned with openness and sharing. D2L creates separate, isolated jail cells. Sophia creates connections among people. See below for a glimpse of the tool. Sign up for the private beta to browse around. Or just keep an eye open after March 7, when everyone can access Sophia content without registering and for free. And if they do their job well, the next time you Google “inverse operations” or “Wump hats” or “Circles” (and I know you do-WordPress diagnostics tell me so), you just may end up reading my Sophia packets. D2L. Ugly, ugly, ugly. Note the big, black bar with the tiny headings and multiple bad icons. Sophia is much cleaner and prettier. The black feels like a background, rather than an intrusion.